We did it! Bambino is now full term. He could come any day. All along I have felt that he would come early, and I still feel that way. When do you think his birthday will be? Here is the background: According to LMP my EDD is September 23. However, according to the first ultrasound and my charting the due date is September 16. So let’s just say my due date is somewhere between September 16 and September 23. I’ve been measuring right between the two dates all along. For the last two weeks I’ve had an increase in contractions and cramping and the baby’s head is engaged. I feel like he will be born the week of September 12th. So? What do you think? When will he be born? Whoever guesses the exact date will win a $25 gift card to the place of his/her choice (as long as I can order it online). If several people guess the right date I will pick the winner at random from the group. Labor Day weekend was not spent in labor. Instead we stayed in Philly relaxing, enjoying yummy food with friends, and checking more items off of our to do lists. My lovely husband installed our Orbit Baby car seat base, and after a bit of trial and error we put it on the passenger side. We even vacuumed and scrubbed the car like crazy. It is ready for the arrival of our prince. *Previous belly pics can be found here. Trig wanted in on the belly pics too this week! This week I also began walking as much as possible. I have walked every day! Sometimes I have to stop and sit on a bench from a strong contraction or back pain, but it is so nice to be moving. 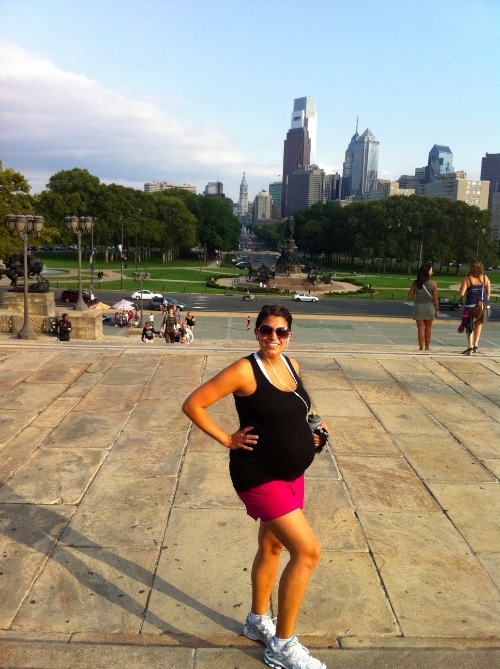 We even did the famous Rocky steps together a few times. I was so out of breath after one set, and I loved every minute of it. Operation Eject Baby is now in motion. I don’t want the baby to come before he is ready, but I do want to get my body as ready as possible. Step 1 means lots of walking but also lots of resting. Not sure yet what step 2 will involve. Trig and I are already playing house. My nonna gave bambino this hilarious duck, and we play him all the time. He’s so cute right? You can’t help but laugh. At the end of the week I plan on making as many freezer meals as possible. Instead of the original plan I think I will just make a couple of batches of bolognese sauce (great with pasta or soft polenta) and plenty of cheese boreg– once my mother in law teaches me how. 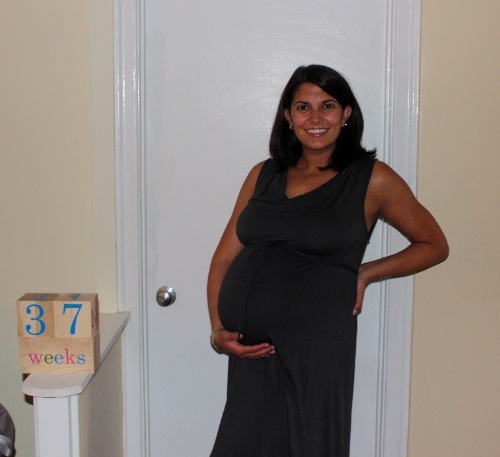 I’m not going on an official maternity leave anymore until the baby comes. My plan is just to work as much as possible- I will take a few hours here and there to rest or get tasks done as needed, but I will also work as much as I can. I think that is a good plan to allow me to keep working but without the pressure of needing to sit at my desk 8+ hours a day. 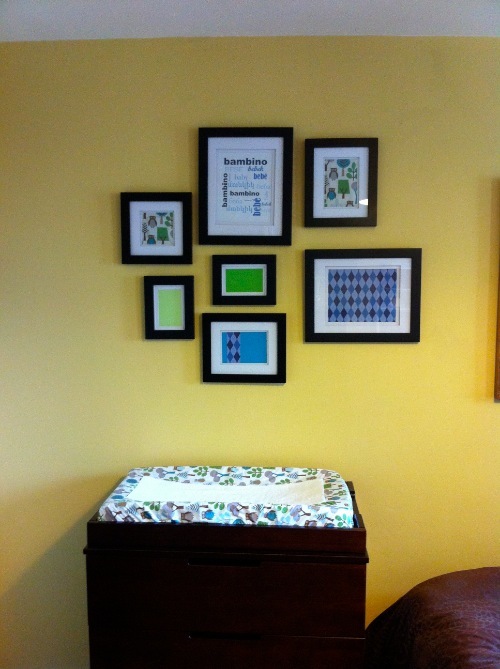 Another step in the nursery is done! We hung up the prints and will take our time to replace them with meaningful art. Now we just need to decide what to put above the crib. 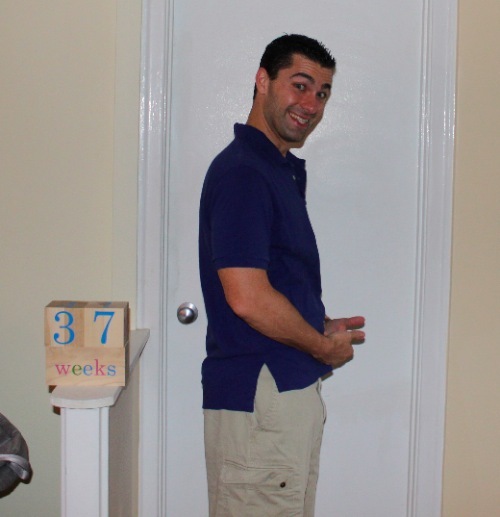 I am so excited that our little boy will be here any day in the next few weeks! Overall weight gained: I stepped back on the scale just to see, and it seems as though my weight gain is tapering off a bit. I’m around a 37 lb weight gain right now. 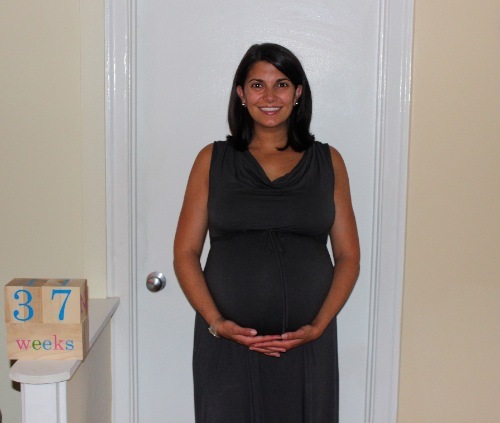 Exciting things to look forward to this week: a prenatal massage from Nicki (she comes to the house! ), a trip to Buy Buy Baby to pick up a second car seat base, and my last birthday before becoming a mom! DUCKY! My nephew has the same ducky and loves him! It’s his favorite animal. You look great…best wishes for a smooth birth! My guess is Sept. 23! So excited for you. I’ve enjoyed following your pregnancy from the beginning. My first is due Jan. 1 so it’s been helpful reading about your experiences throughout each stage of pregnancy.